“And then a most bizarre chord—the Neapolitan. Don’t worry, it won’t be on the test,” quipped lecturer Robert Greenberg, as he described the development of Franz Schubert’s final string quintet. School was back in session at St. John’s Presbyterian Church of Berkeley with a near-capacity audience surprisingly attentive for an early morning concert. A fruitful collaboration between Greenberg and the Alexander String Quartet, San Francisco Performances has been presenting this very popular series of lecture/concerts since 1994. On Dec. 15 they delivered the conclusion to their four-part series on Schubert, and it was simply stunning. Greenberg’s acumen, spiced with heavy doses of humor and over-the-top enthusiasm, was thickly illustrated by five live musicians. As a teaching device this was incomparable, steeping us in the culture and life of Schubert to deepen the pleasure of the following concert. Mixing erudition and comedy, Greenberg described the final years of Schubert’s short life—he died at 31—as he analyzed the Quintet. Beethoven was an idol to Schubert, but whether the two ever met is in some doubt. Greenberg asked how they could live in one city and not know each other. “The population of Vienna in 1810 was 260,000, approximately the size of Plano, Texas.” But despite this proximity, Schubert lived and died in obscurity. “He had as much luck with the publishers as I have had with pole vaulting,” lamented our somewhat portly lecturer. He went on to describe how Schubert carried the torch at Beethoven’s funeral, and one year later was buried nearby. “And the Scherzo sweeps through like deodorizer in a men’s locker room. (Turning to the musicians) Deodorize us!” And indeed it was a manly breath of almost martial airiness. That finale elevated folk themes to art, employing a facility between major and minor that mixed joy with sorrow. After an easier passage, “as comfortable as an old pair of slippers, gemütlich, entirely Viennese,” according to Greenberg, they shifted back to minor, “with a D flat as frightening as a house call from the IRS!” Leaving humor behind, he flatly stated that this dark note makes the earlier melodies achingly nostalgic. Thus forewarned, all was recast in our minds as we heard the full version. And indeed it was aching. The musicians swept into the sumptuous first chord, and then the top four instruments took the motif for ten bars, answered by the lower three and the bottom cello, cleverly turning the five instruments into two separate quartets. But then they merged in the development, five voices that combined the scope of an orchestra with the clarity of soloists. Their second theme was so shyly sweet it turned despair into an otherworldly joy. That passage, engraved on violinist Joseph Saunders’ tombstone, left several damp eyes in the audience. Famed pianist Artur Rubinstein requested that the following Adagio be played at his funeral. And the finale! Here Hungarian folk melodies were given a noble inventiveness, in between passages of tender dissonance. I have heard these musicians many times, and always enjoyed them, but that morning they truly embodied the work, weaving us into their spell for a wondrous hour. In January the Alexander String Quartet and Greenberg will begin a new series, “The String Quartet at a Time of War: Benjamin Britten and His Contemporaries.” The first two episodes, January 12 and 19 at 10:00 a.m. in San Francisco’s Herbst Theatre, will feature quartets of Britten, along with Pavel Haas (1/12) and Bartók (1/19). Greenberg’s facility for infusing musicology with compelling historical narrative, combined with this excellent Quartet, should make this series a stand-out. The last two performances will be March 9 and 16. See www.performances.org for information, program notes and tickets. 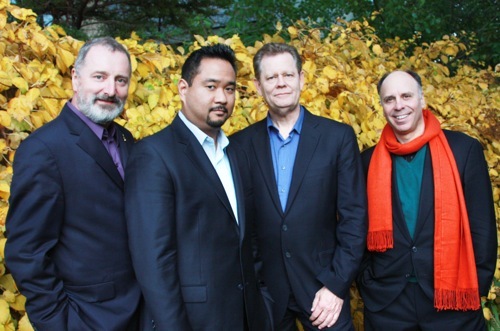 Photo top of Robert Greenberg; bottom, ASQ members were joined by cellist Eugene Sor (not pictured) from left: cellist Sandy Wilson, violinist Zakarias Grafilo, violist Paul Yarborough and violinist Frederick Lifsitz.